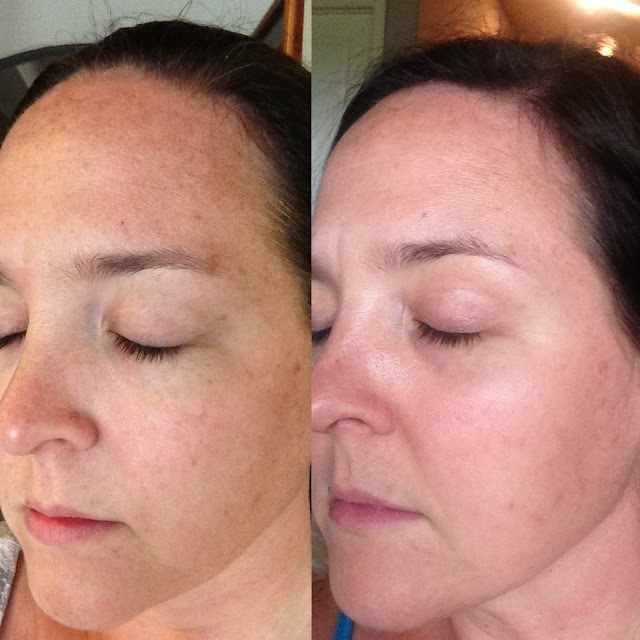 I have been using the Reverse skin care regimen from Rodan + Fields Dermatologists for around 90 days. This skincare line was created by the doctors that created Proactiv. REVERSE LIGHTENING claims to "Erase the signs of premature aging, including brown spots, dullness, and sun damage. REVERSE Regimen exfoliates, lightens, brightens and protects your skin for a more even tone and texture." First of all, I am the biggest skeptic EVER! So, I was blown away after 2 weeks of using the regimen, my skin looked so bright & even toned, & so many of my freckles had faded. I WAS SOLD! The picture above is my before & after at 90 days. The pictures are horrible, the before pic is fuzzy & the after pic is very shiny (because I had just applied the step 4 sunscreen). I really didn't believe there were products out there that actually changed your skin & did what the label said they did. I guess I thought products were just for preventing sun damage & slowing down the aging process. While Rodan + Fields products do those things, they also change your skin! My skin tone is so even now, I can go without any concealers, powders or foundations, & feel pretty & natural. Some people love their freckles, however, I do not. But, my goal with using REVERSE is really not to erase all my freckles, but to brighten my skin, give me a more even complexion, & to erase some of the uneven sun damage splotches on the top of my forehead. The rest is just a bonus! REVERSE is a 4 step regimen, each step relies on the other. You have to use all 4 steps to get the maximum results. The "products are based on a philosophy of Multi-Med Therapy—using the right medicines and active cosmetics, in the right formulations, in the right order." You can use REVERSE until you achieve the results you want, or up to 6 months. 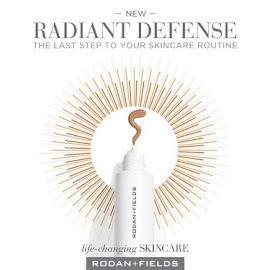 Then you get to the goal products, the REDEFINE anti aging line. 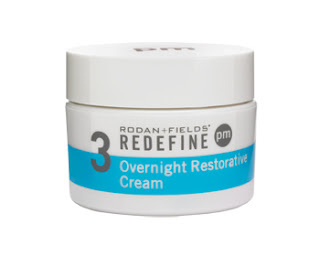 I experienced some dry spots while using REVERSE, so it was recommended that I add REDEFINE Overnight Restorative Cream in the evenings. Since the first use, I have had no more issues with dryness. I only use it a 2 or 3 nights a week. The nights that I am just too lazy to do my 4 step REVERSE regimen, I use the REDEFINE Eye Cloths. 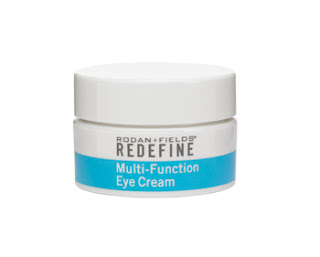 Not only do they gently & safely remove eye makeup, but they remove all my makeup, while depositing cosmetic ingredients to combat the visible signs of aging, including PEPTIDES. 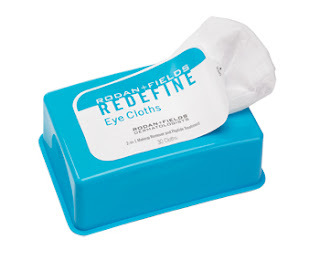 They are called Eye Cloths, but they are made for your whole face. And, this is the newest product I've added to my routine, REDEFINE Multi-Function Eye Cream. I have only been using it for a week, but already love it! It is so silky & thin, I think the tub may last me a year! or visit my website for product info- Rodan + Fields Products or go to the Solution Tool & let the Doctors that created Proactiv, customize a skin care plan for you! Results are guaranteed, the company offers a 60 day, empty bottle money back guarantee. There are 4 regimens, REVERSE, REDEFINE, SOOTHE, & UNBLEMISH. Each regimen is packaged to last 60 days. Products are currenly only available in the U.S., they will be available in Canada in January. Thank you for going into detail about the products you use. I got my order yesterday and was so excited to use it for the first time! Your results have been amazing thus far! I'm so excited you are trying it Jenny! I know it's akward, but take a good before pic!